In the corporate world, businesses are regularly graded on the value of their assets: They report to their shareholders about the physical assets they own, their cash in hand, and revenues and profits, both past and expected. But when it comes to measuring their knowledge assets — the value of those can be harder to gauge. However, the entrepreneurial management of knowledge assets can be critical to the success of any business. In this interview with Knowledge@Wharton, Wharton management professor Ian MacMillan, who is also director of the Sol C. Snider Entrepreneurial Research Center, and Wharton adjunct professor Martin Ihrig, who is also a practice professor in the University of Pennsylvania’s Graduate School of Education, talk about how organizations can determine which of their knowledge assets are the most strategically relevant, and how best to deploy them. Martin Ihrig: Knowledge assets are the knowledge drivers of an organization’s success. And they can be unstructured, tacit knowledge. So as an example, there would be the deep expertise of key personnel. Or knowledge assets can be structured, explicit knowledge, codified. Examples there would be patents, copyrights and intellectual proprietary rights in codified form. What is interesting with knowledge assets is that the more you structure, the more you codify knowledge, the easier it is to share that knowledge, both internally and externally…. Very structured knowledge can be shared in milliseconds via the Internet, whereas deep expertise or experience, it takes more time to share it with other people. Ian MacMillan: And the other thing that I think is important about knowledge assets is to think of the term “assets” like you would with physical assets. There are some pieces of knowledge that are just not valuable from the point of view of the firm. And there are others where that knowledge is basically fundamental to your ability to compete. And this is where we start to distinguish between “knowledge assets” and let’s say “strategic knowledge assets,” which are the pieces of knowledge that make a difference in your ability to compete and prosper. Ihrig: When it comes to physical assets, you have a balance sheet that shows you what you own or possess. It’s more difficult, more tricky when it comes to knowledge. So with a knowledge map, we intend to really identify the key knowledge resources that underpin an organization’s competitive advantage. And we map them along two dimensions: One is the structure of knowledge, unstructured to structured, tacit to explicit. And the second dimension is the level of diffusion. Do only a few people in the organization have that knowledge? Do many people in the organization have access to that knowledge? Or does the competition have access to that knowledge? Or is it available to the general public? So those two dimensions — structure and diffusion — are important to map those critical knowledge resources Twitter . MacMillan: A sort of simplified rendition of that is depicted in the diagram that we’re looking at now. So what you have is the two dimensions. To keep it simple, highly diffused or highly undiffused, and then highly structured or codified and uncodified. So that gives you sort of four blocks in which you can place your knowledge. Ihrig: When you look at knowledge management [historically], there was a tendency to try to capture all the knowledge in an organization. First of all, this is not possible. It’s really hard to capture all the tacit experience and put it into a computer system. But even if it were possible, you’d suffer cognitive overload because it’s just too much. So what we propose is [to] really focus on the knowledge assets that are critical for success and underpin performance. 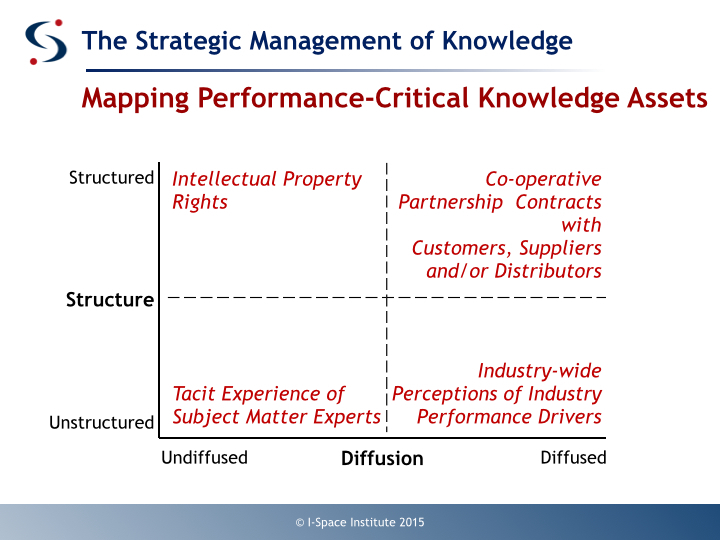 Those critical knowledge assets should be mapped so that the management can decide how to further develop [them] to create growth and competitive advantage. MacMillan: Associated with that is the fact that you can take knowledge in the four blocks that we identified, and each one of those blocks has specific indications for your ability to take that knowledge and go out and create and capture value from the marketplace. Ihrig: The strategic management of knowledge links knowledge to competitive performance and growth. Now, with the entrepreneurial management of knowledge we try to understand how innovation is created in organizations. How do organizations, big and small, create new ideas, create new knowledge? How is that knowledge then further developed in the pursuit of innovation? How is it shared and applied to different contexts? This link to innovation, which is really important, is captured by the entrepreneurial management of knowledge. With the research initiative, we tried to create research that has impact, to really balance theory and practice. The outcome of the research initiative has been both academic publications and practitioner-oriented publications. And we’ve also been able to build a new executive education program at Wharton that deals with the strategic management of knowledge assets. MacMillan: And going back to the two-by-two [grid] that we set up earlier, each one of those blocks has specific challenges associated with how you strategically deploy that knowledge and how you go about innovating. So knowledge which is very codified and diffused out and everybody knows it, the challenges are very, very different from basically being able to go in the bottom left and capture the expertise of your key people in the organization and think about how you can use that knowledge to create competitive advantage. Ihrig: With knowledge networks, we try to understand the linkages between knowledge assets: How are they related and how do they interact? A little example would be looking at a patent on a new technology: That would be one knowledge asset. And another knowledge asset would be the experience or the expertise of the key engineer that developed that patent. So two knowledge assets linked to one another, that’s a mini-network. So the question is, when we want to be strategic about knowledge development and the sharing of knowledge, can we give away one knowledge asset and hold onto another knowledge asset. So looking at Tesla for example, which last year opened up its patents to competitors: They might have given away the patents, but they haven’t given away the engineers that worked on the patents. So it’s very clever. They give something, but the competition cannot necessarily do too much with it, because another part of the knowledge network stays within the organization and is not shared. MacMillan: To me, there are two challenges. One is, as I look at my various knowledge assets, can I think about ways of linking them? Because if I link two knowledge assets, that allows me to come up with a new combination, and that might be very, very powerful. Then the other one is, how do I, particularly with the more tacit types of knowledge, actually identify that knowledge and where we can get traction using that knowledge in a competitive marketplace? Ihrig: When we think about open innovation and sharing knowledge or giving away knowledge, before you can decide what to share, you have to know what to have. So to me the first step in any open innovation initiative or strategic alliance initiative has to be looking inside and thinking about what are the critical knowledge pieces that I have. And what are knowledge gaps, what are knowledge assets that I don’t have and might be able to source from the outside? So I think it’s really important to have a strategic knowledge map to think make informed decisions about who to partner with and what kind of knowledge to obtain from partners. MacMillan: And if you think about it, combining two pieces of knowledge in some novel way is the essence of what most or all entrepreneurs do. And the challenge than becomes, I have a piece of knowledge, and I may underestimate its true value until I start thinking about who else might have knowledge that I can link up [with]. I don’t have to have the new knowledge myself. What I need to do is find some way of identifying whether that knowledge would be useful [as a component in] some new combination. Ihrig: There’s a huge culture and political dimension when it comes to the sharing of knowledge. And when we look at people and their motivations, also in terms of their careers, sometimes it’s difficult to incentivize them to share that knowledge. [But] innovative technology companies, like for example Google, [find] ways to incentivize people to work together. … One day a week, you can [work on] whatever [project] you want to do, but [you must] do it in teams. So there are ways, I think, to bring employees together and take [away] the fear of sharing the knowledge, and make sure that they contribute to a common goal. I think that’s important — to establish that goal and make everyone feel comfortable to work in a team. MacMillan: This might be an opportunity to put up another chart. 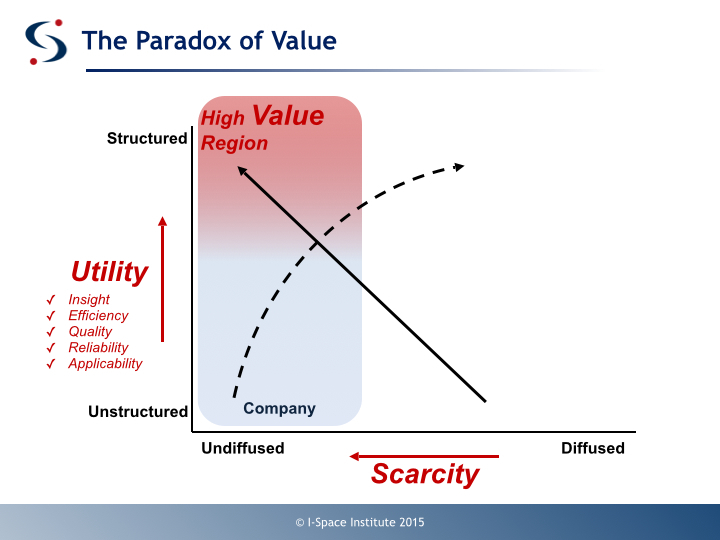 This shows you that up in the top left-hand corner of the chart is where value lies, because what you have is undiffused knowledge, so other people want it. And you have it. And what you have is highly codified knowledge, which is easy to replicate and to use. Here’s where the dilemma lies: The people up in that top left-hand corner want to try to keep that value. And unless you formally recognize that it’s necessary for that knowledge to be spread in the organization so that you can go forward and prosper competitively, it just isn’t going to happen. So unless you’ve got some kind of map that shows you where the valuable knowledge lies in terms of getting fairly early returns on it, people are just not going to share it. The second thing is to start to begin to think about how can I reward people for being willing to share? MacMillan: The second point is that if you’re up in that top left-hand corner, what you really need to identify that the knowledge is in that [category]. To prevent people from trying to retain the value of that knowledge by not sharing it, you need to have that formally recognized in your reward system. Ihrig: Within the company, you would like to share all your knowledge, but outside the company, you have to be strategic: You don’t want to necessarily share your knowledge with the competition. But once you have the map, once you know what is structured, what is unstructured and how diffused it is, you can make those strategic decisions. Ihrig: If you have a look at the chart, what you have is — in the simplified world — four blocks. And there are companies that historically have played in each one of those blocks. And it might be interesting just to talk very briefly about that. If you look at the bottom left-hand block, this is where the essence of your knowledge is deep, tacit expertise, which is kind of hard to articulate. And that’s resident in the minds and experience of experts. Typically, [the companies] you’d find there [are] like Goldman Sachs, which is brilliant about being able to use financial expertise to come up with new kinds of financial instruments that it can take into the marketplace. And as the old menu changes, it keeps on changing as well. So the heart of the firm’s knowledge is to be able to tap that expertise. A much more pragmatic example of that would be Bain, the consulting firm, which is particularly interested in deeply understanding and being able to develop new solutions for new problems. The top left hand side [are organizations that]would be depending very much on using protected knowledge that has been patented. So examples to this day of the most prolific companies in terms of patenting are people like IBM, people like Samsung, people like Canon. And the essence of their knowledge is to keep on generating new, protected patents. As we move to the right, the knowledge gets more diffused. 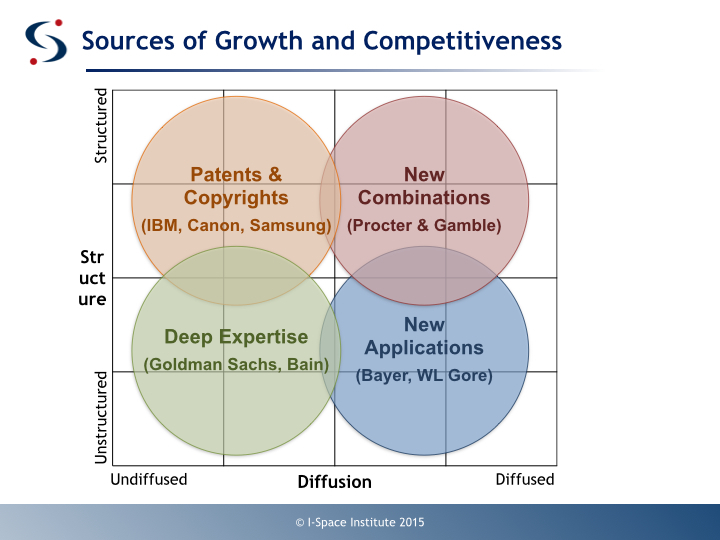 The companies up at the top right are companies that are able to come up with new combinations of existing knowledge. A beautiful example — and in fact the source of the concept of open innovation — was [CEO] A.G. Lafley at Procter & Gamble, who basically said: “Why do we have to create new knowledge ourselves, why don’t we go out and find solutions to the problems?” And this led to amazing products like the Swiffer. It was a very, very big business and was just created from basically taking old mops and detergents and [thinking about them] in new ways. And then, the bottom right is perhaps the most interesting. That [is where you find companies] that are constantly experimenting with trying to find new ways of applying their existing knowledge. And our two favorite examples: The German company Bayer, which for 110 years has been creating new uses for aspirin; and W.L. Gore, which is constantly innovating around the use of Teflon. Ihrig: I think for senior management, it’s important to think about [this]. What kind of knowledge assets does my organization have? Is it in the bottom left, the top left, the bottom right, the top right? And then, how do I want to strategically develop that knowledge? There are opportunities for growth in each of those quadrants. Ihrig: We’ve just published a Harvard Business Review article about the topic. We have created a three-day executive education program at Wharton that helps people understand what is strategic about the development of knowledge. We have experts like Peter Cappelli talk about the management of tacit knowledge, talent. Our vice dean for innovation, Karl Ulrich, talks about technical innovations. It’s an interesting mix of faculty discussing the challenges that come with managing knowledge strategically. MacMillan: Martin, when he did his dissertation on the topic, actually developed a way of simulating the evolution of knowledge by making some fundamental assumptions about the nature of knowledge and then how that evolves using different types of strategy for knowledge development. So if you have a particular knowledge strategy in mind, you can test it in the simulation, and test 100 years of knowledge development in a few minutes. It’s a very powerful way of beginning to look at the implications of making certain strategic moves in knowledge management. While you use the examples of Goldman, or Proctor-Gamble, I am quite concerned over high-tech industries such as aerospace. In these industries, intellectual capital and the sustaining and improvement of knowledge across time is crucial. This “tribal knowledge” is required for both sustainment of current products as well as taking new ideas or solutions into usable products due to the involved technologies only learned by time, patience, and perseverance. The crux is this: nearly all large corporations have dropped pension plans in favor of 401(k) type plans. Now, instead of technologists spending their career at [probably] one company, they are free to move about, bringing their portable savings along. That paints a knowledge picture not quite so rosy; instead of moving north-by-northwest in knowledge, we will see an erosion moving south-by-southwest. While the saying goes that we cannot solve tomorrow’s problems with yesterday’s ideas, how can we solve major technical problems if no on in the workforce has knowledge based upon experience, that no engineer has more than one or two years tenure in the technology? I am deeply worried about the future of American companies in these arenas. Thanks. I am not sure, whether we can use the term “assets” or “capital” in this discussion of Knowledge and Strategic Management of Knowledge. Personally, I prefer to use “capital” in this matter. My reason is that “assets” is that something that can be used up, and attached to some kind of tangible and visible matters. While knowledge is something that can not be used up and not just stand still but it enhances and develops along with the development of individuals, including individuals who hold the management.